Beautiful rustic style property enjoying panoramic views of the area. Utilities: All Services connected including central heating system with gas. Rustic Style Country House in Piemonte. 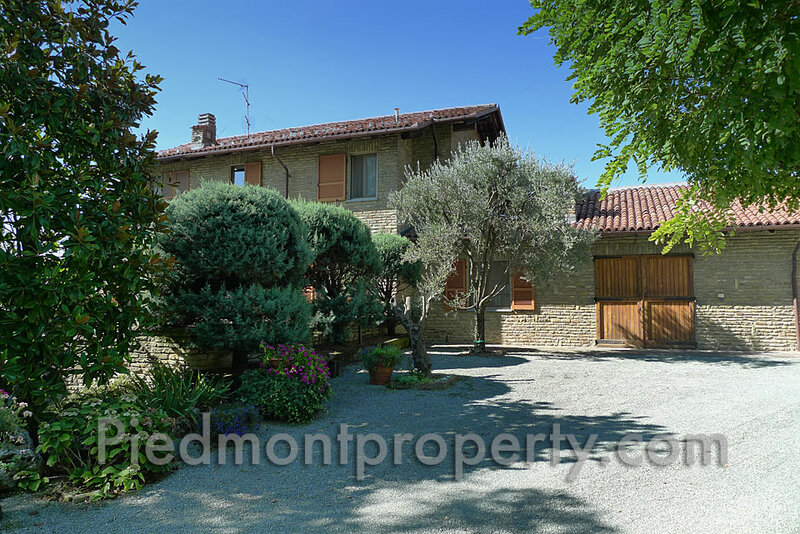 This charming property is in a commanding hilltop position with amazing views of the surrounding vineyards and mountains. Approached by a good asphalt road, it is located in a quiet and private position but not isolated, with neigbouring houses in the vicinity. 5 minutes in the car to two large towns where you find the market, shops, grocery stores, restaurants, bars, schools, delicatessen - everything you could need. The well known and historic cities of Alba, Acqui Terme and Asti are all within 30 minutes. This traditional Langhe stone house dates back to the 1790s and has been completely restored over the years and provides a spacious family accommodation over three floors. The house has 3 large bedrooms plus a master bedroom suite. There are two large full size bathrooms and two half bathrooms. The property boasts a charming fireplace which can be enjoyed from the dining room and living room. Wonderful master bedroom suite consisting of a large sleeping area, a reading area with enclosed fireplace, a sitting room, a large bathroom with two covered terrace with wonderful views of the surrounding valleys. The garden areas are beautifully maintained and include a wide selection of mature trees and plants There are plenty of charming outside areas perfect for alfresco dining, taking an apertivio or just soaking up the warm summer sunshine. The garden has an automatic irrigation system and a collection system for rain water which can be used in the gardens.